Thermaltake Technology continues to fulfill the corporate mission of “delivering the perfect user experience”, and regard “building Thermaltake Technology into a cultural brand for the enjoyment of entertainment, e-Sports, technology and lifestyle” as a vision, in order to bring the joy to all the users worldwide. Since the collaboration with BMW DesignworksUSA for the creation of “Level 10” and got awarded with “red dot design award : product design 2010”, the “Level 10 GT”, especially built for e-Sports gamers and DIY enthusiasts, deriving from the concepts of Thermaltake and BMW DesignworksUSA, has also got the award of “red dot design award : product design 2011” which is recognized as the Oscar Award of the designing field this year, breaking an impressive record! 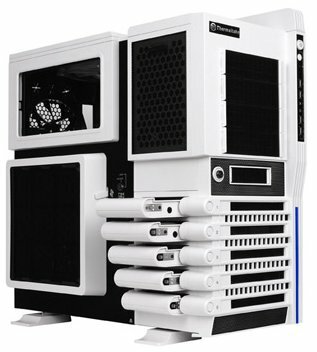 【Level 10 GT Snow Edition】 is a solid quality eSports chassis, featuring superior air flow to prolong the life of the computer accessories. In order to meet the demand for both DIY and eSports with a trendy look and fulfill gaming quality requirements, the implementation of Thermaltake’s QuadFan (Three oversized 200mm ColorShift fans and one 140mm TurboFan) Ventilation concept creates an ideal environment for your components to unfold their full potential. In corporation with the superior cooling system, the water-cooling ready design for enthusiasts features an innovative top removable panel that can be easily transformed to accommodate high-efficiency 24cm radiator. Moreover, all intake fans come with convenient built-in dust filter that can be easily cleaned. Thanks to an innovative technology, Thermaltake is very sensitive to its Uders’ requests, and always think ahead, the【Level 10 GT Snow Edition】 professional eSports chassis emphasizes on the interior space, and has 5 sets of hot swappable hard drive trays for convenience and upgradeability. It provides greatest storage flexibility and maximum data transfer speeds. The side panels and hard drives are secured by an advanced lock system to keep data and hardware safe and secure. With 2 SuperSpeed USB 3.0 connectors right on the top of the 【Level 10 GT Snow Edition】 professional eSports chassis, that guaranteed to operate multimedia peripherals at tremendous data transfer velocities. Moreover, 【Level 10 GT Snow Edition】 professional eSports chassis has implemented intelligent layout and abundance of room for supporting largest components in each category and graphic card up to 370 mm.